My book “Edible Perennial Gardening, Growing Successful Polycultures in Small Spaces” is published by Permanent Publications and can be ordered here. It details the results of my extensive research and experimentation with growing unusual vegetables as a way of providing food from the garden all year round with very little effort. I wanted to find out if there was an easier way to grow vegetables than the conventional vegetable patch. I was looking for vegetables that would be easy to grow and taste good, even if they were initially unfamiliar. In addition I wanted to find out how I could grow them in ‘polycultures’. A polyculture is a mixture of plants each fulfilling a different purpose which is put grown together to create a mini ecosystem. Whether it is spring, summer, autumn or even winter I always have something to eat growing in the garden. Mostly I grow perennial vegetables – so called because they remain in the garden from year to year. Currently many of these vegetables are unfamiliar to many people as they are not widely known or grown. By utilising polycultures to grow perennial vegetables I have been able to develop a way to grow my own vegetables (and fruit) that takes very little time and effort and also boosts the biodiversity, health and fertility of the whole garden. Alongside the perennial vegetables I grow herbs, flowers (including lots of wild flowers) and other plants to fulfil the various functions of a polyculture. I also grow some of the usual conventional annual vegetables like carrots, parsnips, beans and peas mixed into the polycultures. 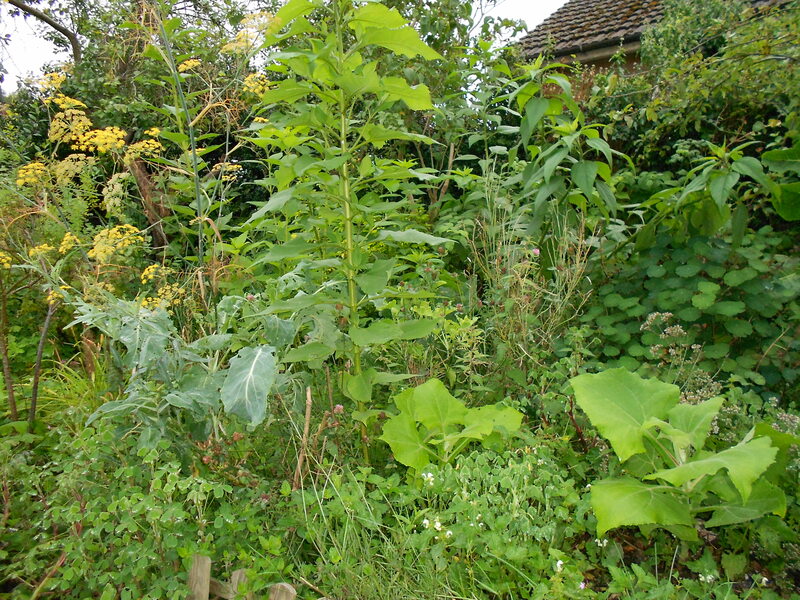 This picture gives a flavour of a vigorous polyculture surging towards maturity (taken in August 2012). I wrote the book to help other people who (like me) would like to grow more of their own food, but who don’t have much time or energy to do so. You don’t need a large plot to do this – my garden is a very average sized suburban plot and I began with a tiny part of it. Neither do you need a particularly sunny aspect – I have successfully used areas of the garden that are shady and damp which would never grow conventional vegetables. Once the fundamental principles involved are grasped the way is open for all sorts of individualised approaches to implementing your own polyculture. This is quite unlike any kind of conventional gardening as you are starting on a journey to co-operate with nature and to discover how much bounty she can deliver. Very much looking forward to reading this, it’s exactly what I need! I’ve been stumbling my way towards a polyculture way of growing over the last couple of years, but have many questions and much to learn. This sound perfect!